by PaulEMoz in "Monty on the Run", "PC", "indie game", "platform", "vvvvvv"
I like to keep something of an eye on the indie games scene, because that's where a lot of the original ideas are, or you can get some cool little games for a bit less than full retail releases. Either way, they make for some good blog opportunities, and I've used them to good effect so far. The next one I fancied a crack at was vvvvvv. Or is it VVVVVV? I'm not sure. And no, I don't know how to pronounce that. 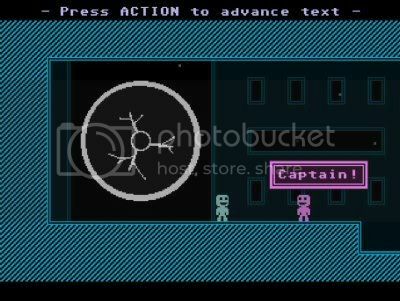 It doesn't matter... it's not called vvvvvv because of any of the characters' names, or anything like that. It's called vvvvvv because the game is filled with spikes. Yep, and you have to collect it. Without the ability to jump. Good luck! Yes, vvvvvv is a platform game. And, indeed, spikes are the order of the day. The game's setup is simple... you're on a spaceship, something weird happens, and the crew are teleported randomly about a space station. You, as captain, take it upon yourself to go and retrieve your crew, little realising that every single room is a treacherous nightmare to navigate. Mostly because of spikes. Yes, I said spikes. And here are some. Oh, and a ghost. You should avoid that, too. The game's controls are simple. You can move left. You can move right. You can't jump... what you can do is a gravity flip. So to get past some obstacles, you'll have to flip upside down and walk along the ceilings, or the undersides of platforms. It takes a fair bit of getting used to, but soon becomes an important and fun part of the game. Now, this sounds a little bit simplistic in this day and age... so to help out in that respect, the game is unashamedly old-school and retro in every way. It's not an exaggeration to say that this could be a Commodore 64 game. From the way it loads, to the character set, to the graphics, to the SID-meets-NES music, it's presented perfectly in the style of a game from 1988. You should look happy, seeing as I've just teleported here to rescue you. The gameplay, too, is similarly old-fashioned... it's evil! It's flick-screen, rather than scrolling, and each screen is named in a time-honoured fashion, and some screens are very devious indeed, while others give you a little bit of a breather. And although some will have you tearing your hair out, eventually you'll suss them and wonder how you ever got stuck. 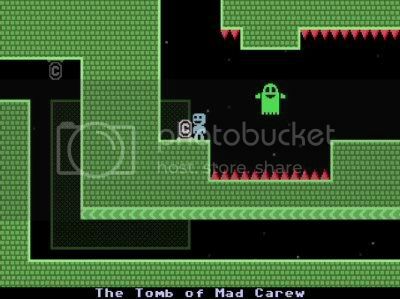 vvvvvv is a throwback in the most delightful way. Even the price is a throwback... it's about a tenner, which is what you would have paid for it in 1988. 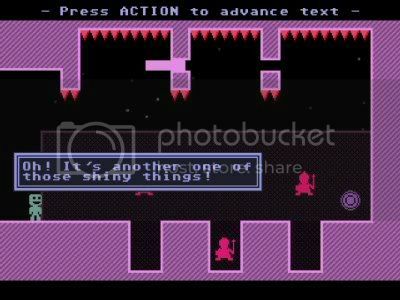 That might seem a bit much for what it is, but if you ever got any joy from vicious games like Monty On The Run, you should at least download the demo of vvvvvv... I reckon you'll get quite a kick out of it.